Dunn’s Marsh Neighborhood Association President Bob Hague reminds neighbors that the Alcohol License Review Committee will be holding a hearing on this Wednesday, November 30, on the application for a liquor license for a liquor store in Madison Plaza, 4611 Verona Road. This is the spot where Dream Bikes used to be located. The best way to make your voice heard is to attend the hearing. It’s at 5:30 p.m., Wednesday, November 30, Room 201, City County Building. 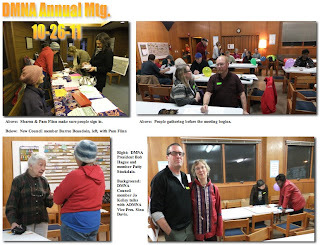 Dates of future DMNA Neighborhood Council meetings have been reserved at the Prairie Unitarian Universalist Society meeting house, corner of Crawford and Whenona. All meetings start at 7 pm. The articles in issue of the e-News covers just one subject, the proposed liquor store in the Dunn’s Marsh Neighborhood. However, 2 picture collages feature the September 17 Apache Pond dedication and the October 26 DMNA Annual Meeting. 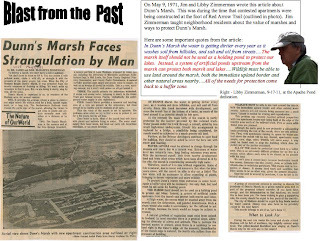 A third attachment takes the reader back to 1971 when naturalists Jim and Libby Zimmerman wrote about how to protect Dunn’s Marsh. 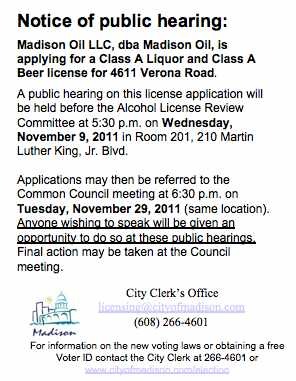 The DMNA has learned that the cancelled November 9 meeting of the Alcohol License Review Committee has been rescheduled to Wednesday, November 30 and that the public hearing on the application for a liquor license at 4611 Verona Road in Madison Plaza will be on that agenda. The location of the proposed liquor store is in the strip mall just behind the Mobil station where Dream Bikes used to be. Both the Dunn’s Marsh Neighborhood Association and the Allied Dunn’s Marsh Neighborhood Association oppose this license. · Application is for a Class A beer and liquor license. · Location is 4611 Verona Road, Madison Plaza mall. · open 7 days a week, 9 a.m to 9 p.m.
· Target market would be the local neighborhood. Individuals who wish express their opinions about the proposed liquor license and liquor store have several options. 1. Attend the public hearing and register in favor of or in opposition to the license. Registrants may either choose to speak or simply register for or against the license. The hearing is in Room 201 of the City County Building on Dr. Martin Luther King, Jr. Boulevard. Meeting starts at 5:30 p.m.
Alder Brian Solomon, <district10@cityofmadison.com> or <briansolomon@charter.net> You can also write to Brian at 2148 West Lawn Avenue, Madison, WI 53711. His phone number is 608-446-1362. Eric Christianson who is the staff person for the Alcohol License Review Committee (ALRC). He will make your communication available to the whole committee. Also given in the ALRC materials as the contact is Thomas Lund, tlund@cityofmadison.com <mailto:tlund@cityofmadison.com> . He can be contacted at the City Clerk’s office, 266-4601. Mr. Lund was the source of the detailed information first published to the neighborhood about this license application. Ready for a little “eye candy?” Click on the attachments. 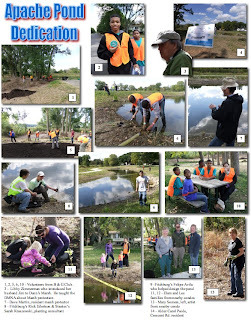 “col Apache Pond dedication.jpg” shows many colorful photos from the September 17, 2011 Apache Pond dedication event. You’ll wish you had been there! 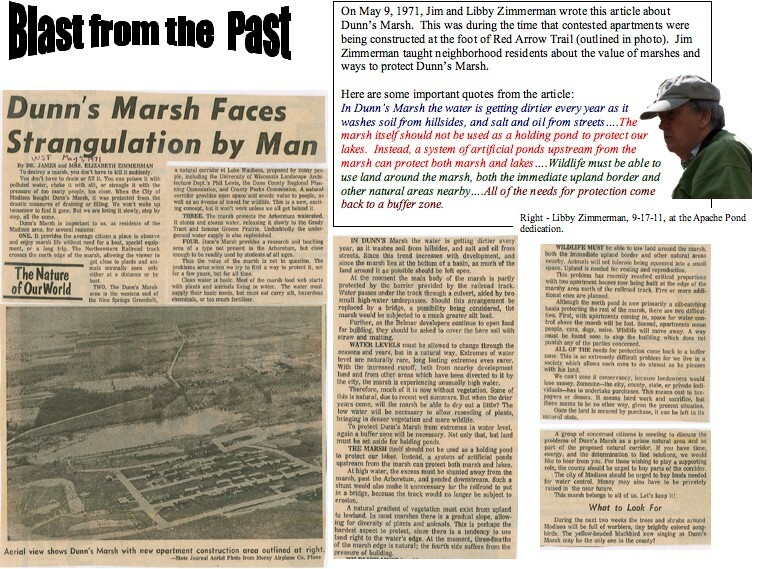 “col Zim article.jpg” is a trip to the past when neighbors protested the apartments going up at the foot of Red Arrow Trail. It’s a picture of a Capital Times article from May 7, 1971. See an air view of the southern part of the neighborhood from way back then. “col DMNA AnMtg.jpg” shows scenes from the October 26, 2011 DMNA annual meeting. These photo collages are small jpeg versions of the original Word documents. Anyone who wants a version with better resolution can contact the news editor. The Word versions are quite large. Alder Dorothy Krause informed me of the ALRC meeting cancellation and I have checked this out with the Madison City Clerk. The Alcohol License Review Committee meeting scheduled for 5:30 pm today, has been cancelled. Presumably, the agenda items including the application for liquor licenses for a liquor store at 4611 Verona Road in the Madison Plaza, will be put on the agenda of the ALRC’s next meeting, December 21. I apologize for the typo in the text of my last message about the liquor store application in Madison Plaza. As the headline noted, this hearing is this coming Wednesday, November 9, 5:30 pm, Room 201 of the City County Building, 210 Dr. Martin Luther King, Jr., Blvd. An incorrect date was printed in the text of an article of last night’s communication. As noted in the last DMNA communication in late October, there’s an application for a liquor store in Madison Plaza for the spot that Dream Bikes vacated. 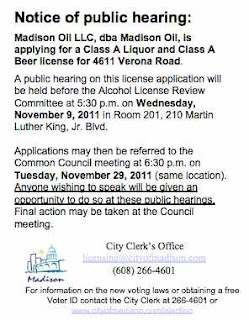 The hearing before Madison’s Alcohol License Review Committee is this Wednesday, November 4, 5:30 pm, in Room 201 of the City County Building, Martin Luther King, Jr. Boulevard. All interested parties are encouraged to attend and give opinions. At its November 2 meeting, the Dunn’s Marsh Neighborhood Association Council voted unanimously to oppose the liquor store and authorized DMNA President Bob Hague to speak at the public hearing. Most other members of the Council also plan to attend and speak against the liquor store. Want to speak but don’t have a way to get to the hearing? Anyone who needs a ride to the hearing should contact Mary Mullen, 298-0843, or mmullen@chorus.net. She’ll either pick you up or try to find someone else to do so. If you cannot attend, you may call, write an e-mail, or sent a snail mail letter. Facts from the application and other sources are summarized below. Here are some people you might want to communicate with giving your reasons for your opinion about having another liquor store in our neighborhood. · The floor plan with the application is unreadable. Currently, response to this application has been negative. A neighborhood resident’s inquiry established that Alder Brian Solomon is opposed. The Madison police are opposed. The Dunn’s Marsh Neighborhood Association is opposed. Several neighborhood residents including Bob Hague, President of the DMNA, have already written to various authorities expressing their opposition. At least one Council member talked about starting a petition against the liquor store. At its November 2 meeting the DMNA Council discussed its reasons for opposing a liquor store in Madison Plaza. These are some of the reasons for opposition. · What a contrast to Dream Bikes, the previous occupant of the space, which was positive for the community in every way, employing young people from the neighborhood and encouraging bike riding. · Our neighborhood is already at risk regarding health due to many factors. It is close to major highways with their noise and air pollution. The neighborhood has a lot of issues with alcohol and drug use, now. You can find a trail of alcohol bottles and beer cans all along the frontage roads and some other streets. Do we need more of that? · We already have one liquor store in the neighborhood, Zimmer’s on the Beltline Frontage Road, 7/10 of a mile away from the proposed liquor store. · Zimmer’s is the site of police calls on a pretty regular basis. · Alcohol is available at many other locations within the neighborhood and nearby. One can buy beer at the Mobil station just a stone’s throw from the proposed store and also at the BP station right next to Einstein’s. Beer is also available at the Speedway gas station at Verona Road and Raymond Road. Several establishments just across Verona Road have alcohol on the menu. Feiler’s Restaurant next to Kentucky Fried Chicken has a bar and to the west right next to the bike path there’s Bennett’s Meadowood Country Club, also a bar. Up on Williamsburg Way is a full-fledged liquor store, Liquor Town, and just around the corner from it is Picasso’s Pizza that also has a bar. · What the neighborhood needs is a grocery store, not another place to buy alcohol.